Making Much Ado About Movement"
In Much Ado About Nothing, Shakespeare employs dancing to cause mischief and mayhem, as well as to convey harmony and order. In this lecture and "hands-on" workshop, participants will learn a "mannerly modest" measure and an aerobic cinquepace, in addition to learning about the function and significance of dance in late Renaissance England and Europe. Dr. Emily Winerock received her PhD in History from the University of Toronto. Previously she was a visiting assistant professor at the University of Pittsburgh and a visiting lecturer at Carthage College in Wisconsin. 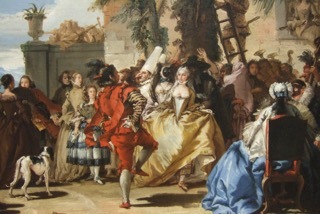 Dr. Winerock's research examines the politics and practices of dancing in sixteenth- and seventeenth-century Europe.